What do we have here? It’s a complete underground temple builder tileset! All assets are hand-drawn, they have an organic feel and there are many variations to each tile, so no part looks the same. This map builder-set produces generic stone-tiled temples. The pieces are varied enough to create plenty of different environments. All assets in this set are 140px per square, 72 DPI. 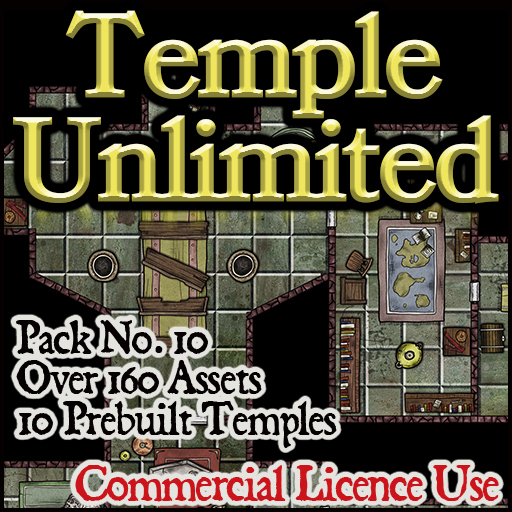 All assets are labeled with their dimensions in squares to look properly in the Roll20 tabletop (i.e 4×4) This pack contains over 160 different assets to build an awesome temple or dungeon. There are 82 unique tokens for furniture and other elements. There are 10 prebuilt temple/dungeons ready to drop for instant bang-for-your-buck. 5 or them are duplicated with no furniture or tokens.